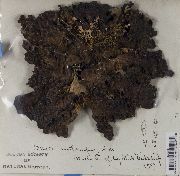 Thallus: foliose, up to 5 cm diam. in the specimen seen (up to 40 cm diam. 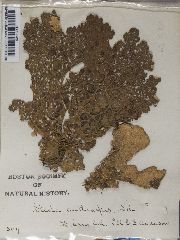 in the Pacific Northwest), leathery, loosely attached, free at the edges lobes: rounded, sometimes elongated and spatulate, somewhat imbricate, (5-) 15-25 (-30) mm across; margins: crenate upper surface: pale to dark brown or pale green-brown, turning somewhat yellowish olive in herbarium, smooth, shiny to matt; often strongly reticulately ridged (with broad foveoles between), soredia and isidia absent medulla: white photobiont: cyanobacterial lower surface: pale brownish, yellowish brown near margin, darker and more grayish toward center, with short spongy tomentum (patchily distributed, with the hairs longer and more clustered in some places); pseudocyphellae: whitish, interspersed among the tomentum and along the margins, 0.1-0.3 (-1.0) mm diam. Apothecia: common, 1.5-3 (-4) mm diam., scattered, laminal along the ridges, emergent then sessile to narrowly short-stipitate; disc: concave and shiny then flat to convex and dull, red-brown to blackish; thalline margin: pale yellow-brown, initially pubescent, thin, subsequently usually disappearing; hymenium: hyaline below and yellowish above, 75-100 µm high; paraphyses simple, coherent at tips; hypothecium: fulvous asci: clavate, 8-spored ascospores: fusiform, 1-septate to eventually 3-septate, straight to curved, 23-32 x 6-8 (-10) µm Pycnidia: immersed, especially on the ridges, ostiole black conidia: bifusiform, 5-7 x 1 µm Spot tests: K- or K+ yellow, C+ reddish or C-, KC+ red or C-, P+ orange or P- Secondary metabolites: two hopanes, with variable amounts of tenuiorin, methyl gyrophorate, and gyrophoric acid with the constant addition of the stictic acid aggregate (Kondratyuk and Galloway 1995). Substrate and ecology: on coniferous and hardwood trees, and shrubs, or over moss, rarely on rock; in moist forests, especially riparian areas, often near the coast in partially open habitats; c. 1350 m in California World distribution: western North America in the Pacific region Sonoran distribution: mountains of southern California, now apparently extinct except for Santa Barbara County. Notes: Galloway (1995) typified this taxon and discussed the original material. This species is characterized by the abundant apothecia, white medulla and pseudocyphellae. Some early records of P. anthraspsis, at least from more northerly parts of California, were based on P. anomala, which is sorediate, but sometimes has apothecia-like galls (blackish and lacking a thalline margin) caused by a parasitic fungus; according to Goward et al. (1994), at least in British Columbia a rare form of P. anomala has sparse soralia, but can be distinguished from P. anthraspis by the more even upper surface and frequent occurrence of apothecia. Although Ohlsson (1973) regarded P. anomala as simply the sorediate counterpart of P. anthraspis, with the same two chemical strains, the two species also differ in other aspects of morphology (Krog 1968, Ahti et al. 1987), and according to McCune and Geiser (1997) in the Pacific Northwest they also differ somewhat in ecology and distribution, with P. anthraspis less common and occurring mainly in riparian areas.